Devon comes to Puerto de la Cruz! Sitio Litre is the famous home of the Orchid Gardens, an absolute ‘must’ on your tour of the north of Tenerife. 12.04.2015 - An oasis of calm just off the bustling main road out of town in the direction of La Paz, the Orchid Gardens are the perfect place to while away a morning or afternoon. 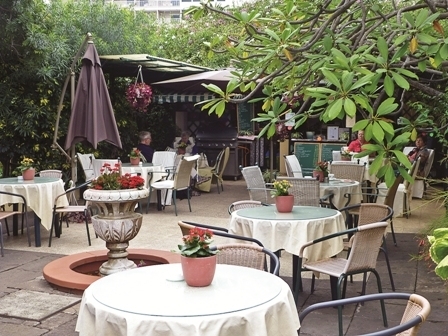 At the far end of the Gardens is a delightful café, run by Kelly Howard and her mother Shirley. You might not even see it if you don’t stretch your garden walk as far as you can go, taking in the majestic sight of the old family home of John Lucas, the owner of the Gardens. But this is all about that café. A dozen tables or so, prettily laid out with tablecloths and parasols, sets the scene. Kelly and/or Shirley will be straight with you offering their menu, inviting you to a good old pot of English tea. We had booked ahead and had ordered the special Cream Tea, and what a luxury it was! We were offered a glass of chilled Cava to put us in the mood, and soon a triple cake stand, laden with delights, was placed before us on our table. The bottom rung was a combination of sandwiches (cheese and tomato, ham and pickle and egg mayonnaise), all with the crusts cut off, just like mother used to do on high days and holidays. These were followed by smoked salmon and cream cheese mini-rolls. Next, we attacked the second tier, which had little apple filled puff pastry dainties, and cubes of meltingly soft chocolate layer cake. Making a mental note to avoid dinner in the evening, we progressed to the top layer, which were home-made scones (made from scratch, not from a mix, as Kelly was quick to proudly point out) accompanied by whipped cream and strawberry jam. It was Kelly’s Nanny Emms who taught her how to make those delicious scones, and many local residents will, I am sure, remember her from the past. Enough! We were defeated! And the price for this cornucopia of freshly made produce? Well, it is only €15 a head (including the €5 entry fee to the Gardens) for all that Cream Tea accompanied by a glass of chilled cava. Just remember that, although you can pop in for everything else on the menu, Kelly needs 24 hours notice for the Cream Teas, as everything is made freshly. Go along in the morning for a coffee, a beer, light lunch, soup of the day, sandwiches or tapas, or almost whatever takes your fancy. Kelly is a master of improvisation. Prices are not expensive, and, if you make yourself known as a local resident, she will gladly offer you a 10 per cent discount. Not unsurprisingly, there is a regular footfall of repeat business. Even the great cruise ships docking in Santa Cruz have heard of her fame, and passengers will provide a regular stream of business whilst on their tours of the town. You should join them. Kelly also offers outside catering services, including weddings and funerals, or just for a dinner party in your home. Ideal for not having to wash up afterwards! But the star of the show is that Cream Tea – we could just as well have been in Devon! Only warmer! Jardines de Orquideas, Sitio Litre. Puerto de la Cruz 38400, Tenerife. Gallery: Devon comes to Puerto de la Cruz! Produced with news.CMS in 0,0721 seconds.